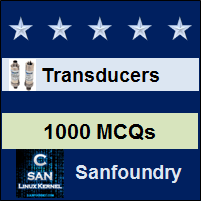 This set of Instrumentation Transducers Multiple Choice Questions & Answers (MCQs) focuses on “Dataloggers”. 1. Which of the following is not correct for data loggers? Explanation: Data loggers are powered from an external source and they require a battery. 2. Data loggers contains microprocessor. Explanation: Data loggers are small battery powered devices containing a microprocessor. 3. Data loggers need external memory for storage. Explanation: Data loggers are devices which are equipped with internal memory. 4. Which of the following devices are similar to electronic data loggers? Explanation: Electronic data loggers are similar to and possibly replaced chart recorders. 5. Which of the following protocol allow the instrument to connect to a data logger? Explanation: SDI-12 protocol allows the instrument to connect to data loggers. 6. Which of the following statement is false? Explanation: All Data logger systems are data acquisition system, but all data acquisition systems are not necessarily data loggers. Explanation: Data logger system have a slow sampling rate and 1Hz of sample rate may be considered to be very fast for a data logger. 8. Which of the following is correct for data loggers? Explanation: Data loggers may vary from simple single channel instruments to complex multiple channel instruments. Explanation: Holter monitors are used for monitoring various electrical activity of cardio vascular system. Explanation: Data loggers generally deals with digital signals and ADC is essential for conversion.